One of the greatest fashion houses in the world, Alexander McQueen, launched it's 2012 Autumn/Winter Prét-à-Porter Collection just a few hours ago in London for Fashion Week. The collection is a beautifully tailored mix of textural florals, Gothic-esque fabrics of weighty and brilliant hues, as well as almost militant tailoring. For the men specifically, Burton showcased some fantastic dark leather, a huge trend this season, in ensembles of black on black, as well as military green and camel. Long trenches and loose fitting slacks add an edge to the collection that is almost historical in a sense, reminding me of 30's inspired cuts. I really like this idea, and have actually seen it pop up in a few other designer's works this season. The traditional, slim cut of the 60's suit will always be a classic, but the 30's silhouette of slightly over-sized fabrics and a weighted fall are very interesting to see again. There is a lot more textural play with the female designs. Burton has given us vibrant, blood reds that shine like velvet; as well as ornate, leafy prints over heavy trenches, and dark, over-sized crinoline. Tailored suit jackets meet overblown and over-sized 50's skirts. This collection is all about fabric; heavy, weighted layering of a variety of textures, and leather, leather, leather; everything that I love about winter! I should mention that we've also been seeing a lot of two-toned pieces this Fall/Winter season, and McQueen is no exception. I'm a huge fan of seeing blocked colours in over-sized pieces, and Burton's work on two-toned trenches and coats at this year's collection is simply fantastic; but not so far from the two-toned pieces we've already seen in seasonal collections by Carlos Campana as well as 3.1 Phillip Lim just a bit earlier this year. What can I say? 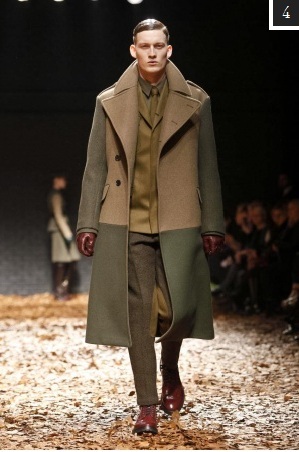 Give me a trench, add a texture, add an interesting line, and it's the greatest new thing I could ever put on. 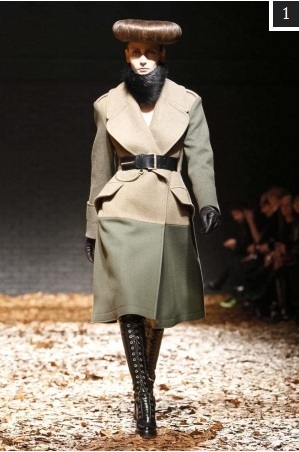 Burton's collection under McQueen is brooding and fierce, I love it. To view the collection in it's entirety, now would be a good time to visit NowFashion, which is a fantastic site that uploads photos LIVE during fashion events. As long as it remains available, the collection is currently up in its totality for public viewing.